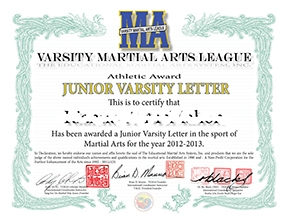 If you are a 8th or 9th grade student in the martial arts (all ranks and experience) or a 10th through 12th Grade student with less than 2 years martial arts experience then you should apply for a Junior Varsity Letter. Click above on the About VMAL tab where you will find answers to the most frequent questions. 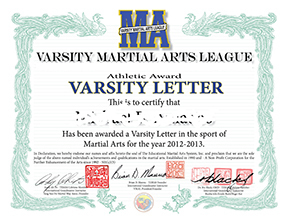 If you are a 10th through 12th Grade student with 2 or more years martial arts experience then you should apply for a Varsity Letter. Click above on the About VMAL tab where you will find answers to the most frequent questions. 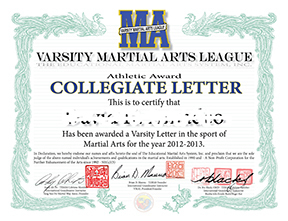 If you are a continued education student with 2 or more years martial arts experience then you should apply for a Collegiate Varsity Letter. Click above on the About VMAL tab where you will find answers to the most frequent questions. My VMAL application was already submited and I need to Provide Payment (click here). Continued growth in education and community development occurs through constant effort in a positive direction with support from sponsorships aand donations. Sponsorhsip in the Varsity Martial Arts Leauge is open for review and acceptance. Please contact donations@vmal.org. You may support the VMAL or TEMAS by making a donation (click here) at www.temas.org or by mail.